Welcome to Marvel Strike Force Heroes page. This is the full description of MSF Daredevil stats, skills and abilities. Daredevil is a vicious brawler who is extra effective against Villain enemies. His first skill delivers enormous damage and has a chance for a bonus attack on the same target. His second skill inflicts medium damage, chains to additional targets and gives Counter to Daredevil. Daredevil ultimate can be cast in the first round and can strike multiple enemies for 480% of his base damage. Dodge chance and increased speed are granted by his passive ability. Daredevil is obtained early in the game but he can be very powerful if resources are invested in him. After the Defenders Update Daredevil has great synergy with other Defender Heroes and especially with Punisher. He starts with three stars and his shards can be obtained through Premium Orbs, Arena store, and 8-9 Nexus campaign mission. Attack primary target for 80% damage +50% chance to Chain to 1 secondary target within 2 spaces of the previous target for 70% damage. Gain Counter. Attack primary target for 170% damage + Chain to up to 2 adjacent targets for 120% damage. Counterattack breaks this chain. Self and Defender allies gain + 5% Speed. This is applied after any character has taken an action. 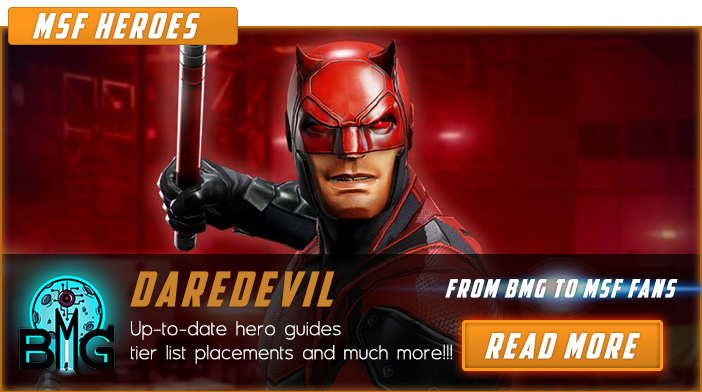 We hope that you enjoyed the description of MSF Hero Daredevil. For detailed information about other MSF Characters check our MSF Heroes page.